The pictures in the accompanying fifteen plates were reproduced from paintings in a parabaik or Burmese folding book belonging to MR. R.C. J. Swinhoe of Mandalay. They represent the pageant of King Mindon (1853-78), the last king but one of Burma, leaving his Placed on the 16th of May 1865, to perform the dedication ceremony of the marble image of Buddha known as the kyauk-taw-gyi Image placed in a small temple near the foot of the Mandalay Hill, Mandalay. This document is a very rare one, if not perhaps the only one now extant on this subject, and it was thought worthy of preservation from an ultimate fate of probable oblivion. It is, moreover, one of the very few extant specimens, well and carefully executed, of pure Burmese art before that art became sensibly influenced by western models and technique a few decades afterwards. It is a model of the last stage reached by Burmese painting after an almost uninterrupted course of, nearly nine centuries, a course which can be followed step by step on the walls of temples scattered over the country. On the whole, it cannot be said that art of painting through all this period has made much progress or greatly improved in its technique. This is no doubt to be attributed to the distracted state of the country which, through many centuries, was in an almost constant ferment of war; such a condition, here as elsewhere, is little conducive to sustained progress in the fine arts. 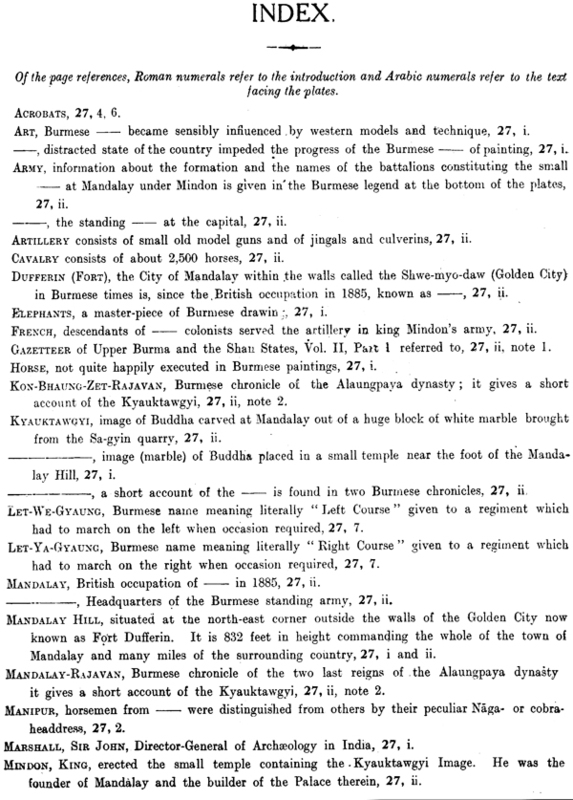 It will be remarked, however, how many of the figures in this document are finely delineated; the elephants are a master-piece of drawing, the animals being absolutely true to the life; judging from the earliest examples own, the Burmese have always exquisitely representing the elephant. The horse, as will be seen, is not quite so happily executed; so also are the examples of it in early frescoes. 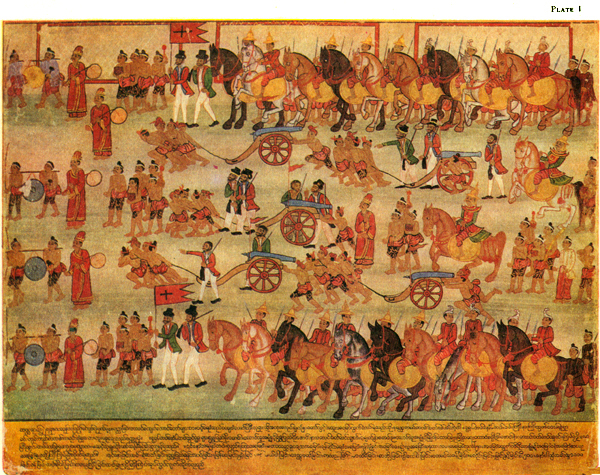 These paintings exhibit a display of the forces in full dress of the Burmese standing army at its headquarters at Mandalay. The quaint dresses of the princes, princesses, ministers, etc, the gorgeous uniforms of the warriors and of the officers; the richly caparisoned elephants and horses; the war-chariots and typically Burmese sedan-chairs, make a delightful and vivid picture. They are now a thing of the past, but the scenes depicted here make them live again under our eyes. They are reproduced here by kind permission of Mr. Swinhoe, the owner of the original paintings, and of Sir John Marshall, Kt, C.I.E, Director-General of Archaeology in India. The parabaik contains fifteen pages, each measuring 22 1/2nX18n; all these fifteen pages represent only scene: the pageant; that is, the parabaik is supposed to be opened to its full length, when the pageant in its entirety can be viewed at one glance. In this, the Burmese had the better of us for, for the sake of convenience, we have been obliged to reproduce the painting on each page as a separate plate with a description facing it. Even in the parabaik, the pictures would not have been exactly understood by the Burmese without the explanations in Burmese at the bottom. It must be here remarked that the explanations in Burmese under each picture, in the plates as well as in the originals, do not necessarily explain the scene above, but mostly refer to the scenes depicted one or two plates back; this is due to the fact of the explanations having been compiled separately, and written subsequently, at the bottom of the parobaik: in such space as could be left for them. The explanations facing each plate are taken from the Burmese below the scenes. 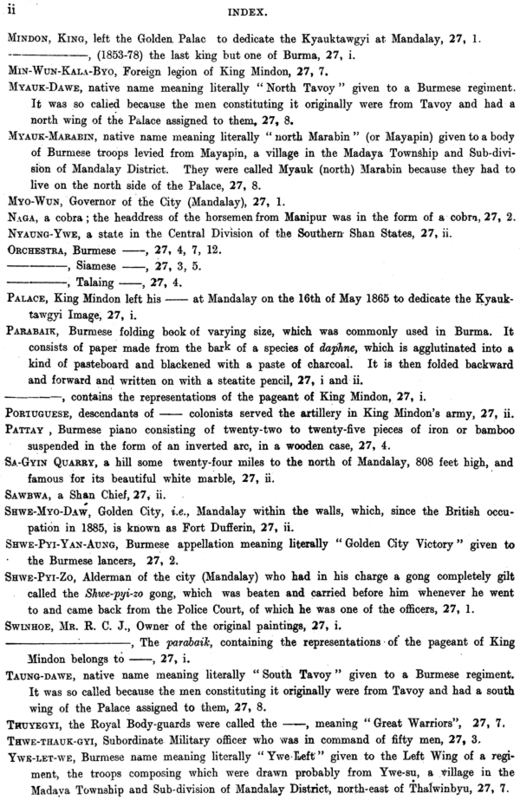 They are not, however, a translation, for the Burmese text bristles with native names of battalions, etc., which, if reproduced in the English explanations, would have made them unreadable and irksome. A careful 'examination 'will show that the formation or constitution of each of the battalions represented is practically identically the same, except in a' few instances; and this is the reason why, unless I had repeated again and again the same thing, the explanations facing some plate' are so short. 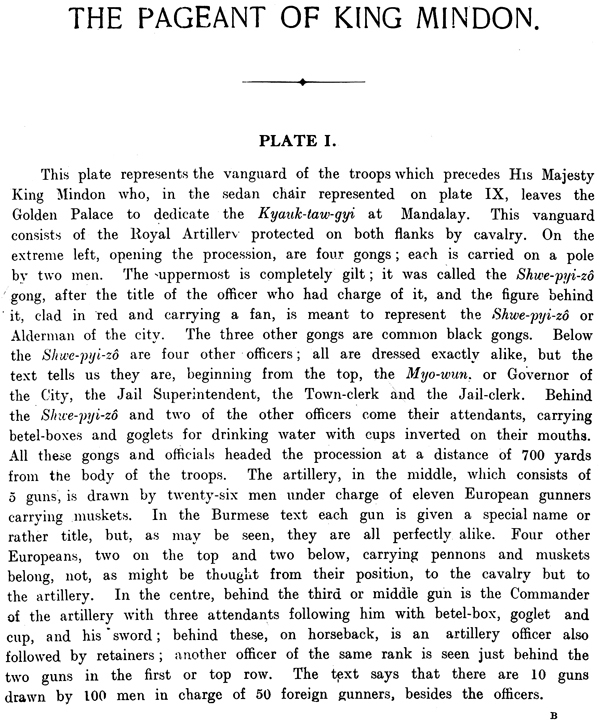 To specialists in Burma anxious to know the formation and the names of the battalions of which the small army at Mandalay under Mindon consisted, the Burmese legend below these plates will give some information. 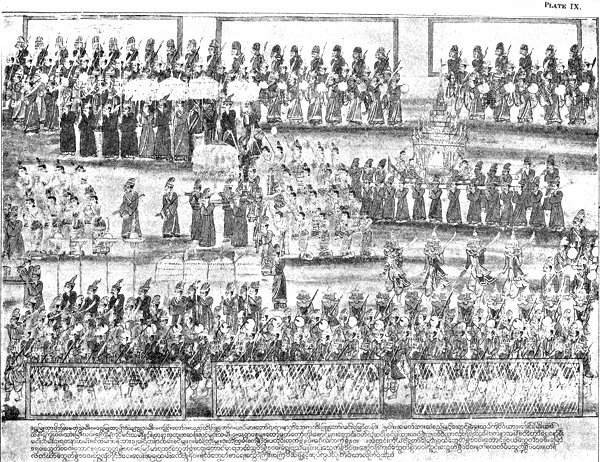 The standing army at the capital probably did not exceed 14,000 or 15,000 men. The infantry, divided into "Inner" battalions, "Outer" battalions and Micellaneou" battalions, numbered about 13,000 men. The artillery was poor, consisting of small old model guns, and of jingals and culverins, all of which may be seen in these plates. The artillery was served by about 500 men, all of them descendants of Portuguese and French colonists or rather prisoners of war, of the 16th and. 17th centuries. The cavalry consisted of about 2,500 horse. We find a short account of the Kyauk-taw-gyi Image and the small temple in which it is housed, in two Burmese chronicles. The small temple is situated at. the foot of the Mandalay Hill, at the north-east corner outside the walls of the Shwe-myo-daw or Golden City which, since the British occupation (1885), is known as Fort Dufferin. King :Mindon erected it, but for some reason or other did not complete it; the corrugated iron roof as it is now seen was put on by the Sawbwa (Shan Chief) of Nyaung-ywe. The huge block of white marble out of which the statue was carved was obtained from the Sa-gyin quarry, a hill some twenty-four miles to the north of Mandalay, in June 1864, and brought over to Mandalay with great difficulty and after many vicissitudes. The King and Queen, from time to time, went to see the progress of the carving, each visit being made the occasion of great festivities. 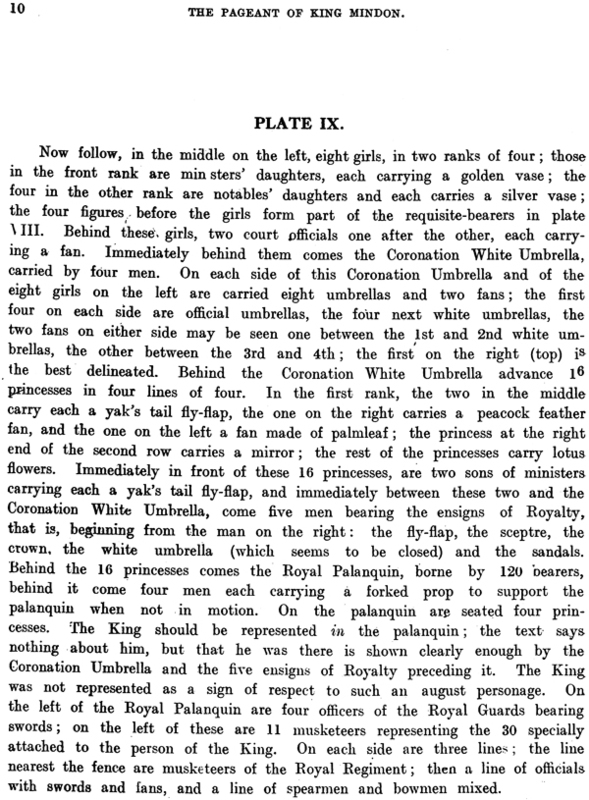 The image was completed in 1865, and the King and Queen, on the 16th of May of that year, repaired in great state to the pagoda to dedicate the image; it is the pageant of this visit which our plates represent. Owing to the high cost of printing plates in colours, fourteen were reproduced in black. The first plate only is in colours; but as these colours are practically the same all over, this plate will give a good idea of the rest.